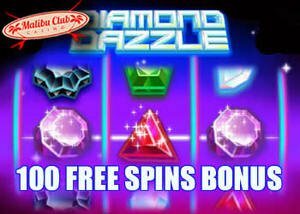 Diamond Dazzle Video Slot is a bright, impressive and glamorous game that Malibu Club Casino is featuring all month long with a no deposit bonus exclusively for the Rival Gaming slot machine. The graphics of Diamond Dazzle slot are marvelous. A huge variety of colours, including blue, purple is used in the design of the interface of the game. This game features 3 reels and 1 payline filled with precious to the rarest precious stones. You will be sparkling with wins in no time when you claim Malibu Club's 100 free spins no deposit casino bonus. This Slot Game is worthwhile, worth your time and very easy to play. If you're familiar with Rival slots, you will know what we're talking about. Head to the casino, open the game and start by wagering your preferred amount using the action button. Then, spin the reels and look forward to hitting an exciting jackpot. Ruby triangle, emerald pentagon, sapphire hexagon, amethyst octagon, etc... are all the precious stones you will find on this exciting new game. Each of them will award a specific prize and you can get the details on the game's Paytable. 3 red gems on the reels will award 450 on the reels, at the max bet. 3 yellow gems will award 300 on the reels, at the max bet and 3 white diamond symbols award 600 on the reels, at the maximum bet. And there's more, such as the black one which is the key to win the top award. This luxurious game offers a pretty simple way to gather winnings on the reels. It's preferable to know the combination of wins for the stones on the Paytable - to know which 3 stones will offer which amount. However, the highest-paying symbol is the Scatter Symbol, the star-shaped diamond. You will get 1500 coins with 3 Scatters on the reels, at maximum bet. Be ready to be showered with sparkling wins when you claim the Malibu Club no deposit bonus on any of the three platforms of the Casino - download, instant play and mobile casino. Play Diamond Dazzle today at Malibu Club casino and you'll not only be eligible for the free casino bonus, you can also redeem a 100% match bonus on your first deposit.